Does Brunne think she would be allowed to even step foot into a Mosque in the Middle East, let alone call the shots? I think she already knows that answer. 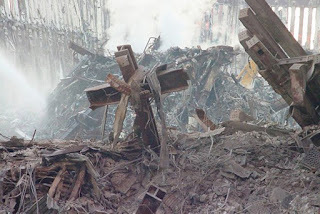 I wonder why atheists protest when the cross at the World Trade Center is displayed at the memorial site. If there is no God, as they say, then this symbol should not offend them, I reason. Just a couple days later, I saw an amazing video of an elderly woman from South Carolina named Clara Gantt and what the cross meant to her both spiritually and physically. Clara was making her weekly Sunday morning drive to church from her Blythewood home when she found herself in the midst of a flood. Her car was swept from the road into a ditch in front of a small local church. Her grandson, Travis Catchings, arrived with some rope and was able to force the car door open before the raging flood waters filled the entire car, but they became stranded as the flooding intensified. A cross in front of the church had become uprooted and lodged against the car, and the two held onto it in hopes that someone would find them. “I was literally, after I got out of the car, holding onto the cross. I was clinging to the cross," Gantt said. They remained that way for five hours until help arrived. During that time, Catchings called his wife thinking it might be the last time he'd ever speak to her. Gantt suffered a broken ankle and hypothermia but is recovering. Her grandson was unharmed. "Jesus is my Savior," Gantt told WIS-TV. "This story is not about me, this is about what He did to save me." Without the cross and the obedience of Jesus allowing himself to be crucified upon it, we would be lost for all eternity and without hope. In Jesus’ day, the cross represented the most brutal form of death. Today, the cross should be a continual reminder for all humanity of the love and compassion God had on us the day He allowed His one and only Son to be crucified on that cross as a ransom for our sins. See John 3:16. As Christians, let us never forget the Cross and its message. And, like Clara Gantt, let us cling to it daily as a reminder of what God has done for us. May the Cross be a constant reminder with us to share God’s love for others who have yet come to know Him. Lord, we thank you for the cross and what you did for us on that cross. The world may try to ban crosses, but we have your cross and its meaning written on our hearts. Copyright © 2015 Downriver Christian Community Church. Theme images by mammuth. Powered by Blogger.